The Workshop was organised to benefit of the members of Samvedna Activity Center, who under the expert guidance of Dr. Rana, deliberated upon the challenges faced by the elderly, and the ways to overcome issues related to ageing. It was a very dynamic and interactive session. While strategic and practical aspects of ageing that require planning, such as financial security by way of pension plans and insurance etc., and having primary support systems in place were highlighted, the relevance of socio-cultural and psychological aspects for healthy and happy ageing were emphasised. Dr. Rana’s recommendations include adopting acceptance as one of the key paths to approaching ageing positively – with acceptance of the physical and social changes that accompany ageing and approaching it realistically and positively, seniors can ensure a smooth second innings. This includes being in control of medical conditions, accepting the necessity of timely medical interventions and adopting aids eg. hearing aids, walking aids etc., if required, without shunning them. This should further be complemented by living a life of gratitude, not one of wallowing in self-pity. 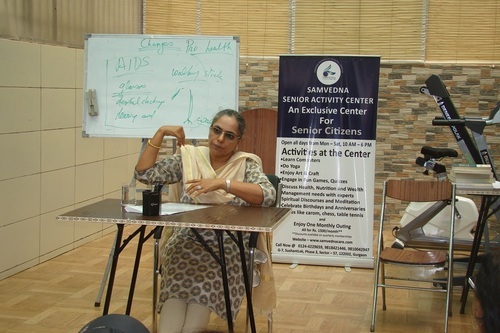 The Workshop stressed that senior citizens should have secondary support systems other than, and beyond immediate caregivers and family-members which include spouse, children and their families, and servants etc. 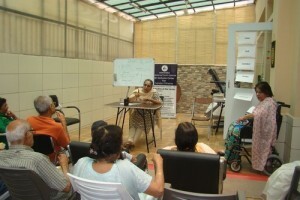 This fosters a degree of independence and is extremely beneficial for seniors. This secondary support system is developed when one spends time and interacts with peers while engaging in group activities which enhance physical, social and mental stimulation resulting in a healthy body and mind. 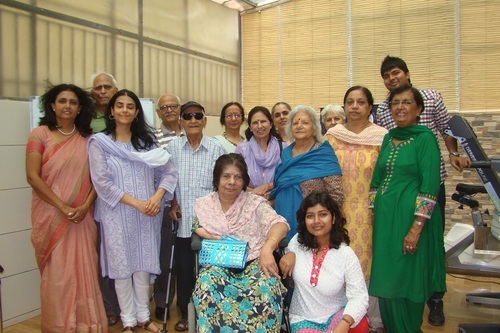 While activities such as light-yoga, dance-therapy etc are beneficial physically, emotional bonding and camaraderie thrive over spiritual discourse, quiz sessions, board games, outings with peers as implemented by the Samvedna Senior Citizens’ Activity Center, are vastly beneficial. While learning a new skill like painting, pottery or other artwork activate motor movements and are known to be therapeutic, learning a language or learning to be technologically self-sufficient with computers etc stimulate the brains cells, thus preventing/delaying diseases such as Alzheimer’s, Dementia etcetera. 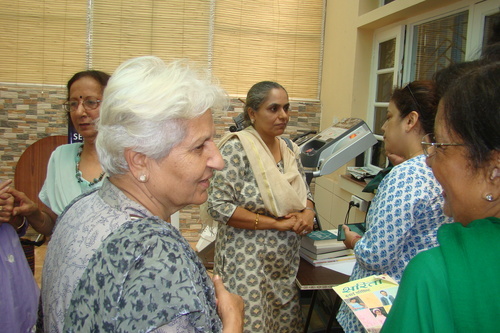 Fostering intellectual companionship is the mainstay of Samvedna Senior Care and its Senior Citizens’ Activity Center in Gurgaon. While concluding, Dr. Rana lauded the efforts of Samvedna Senior Citizens’ Activity Center and congratulated its members for their commitment towards healthy ageing.